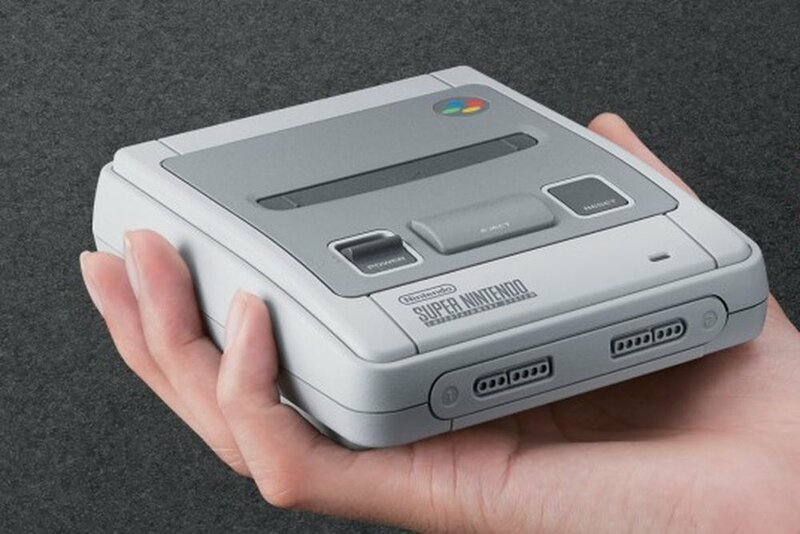 Given the popularity of the NES Classic Edition console that stole the hearts of Nintendo fans for its adorably small size, large library, and decent price, it was no surprise that Nintendo decided to create a similar product for the SNES. The Super Nintendo Entertainment System was first released in 1990 in Japan and 1991 in the US, much to the confusion of the US market especially. Please watch some hilarious news clips from the time of its release that detail the reactions of annoyed parents who did not want to buy a new $200 console just to play the newest Mario game when their kid already had the NES. As evident from these clips, people had to acclimate to the idea of console generations, but as we now know, eventually the SNES became a well-loved addition to any gamer’s console collection and accrued an impressive library. Games such as Super Mario World, Super Mario Kart, The Legend of Zelda: A Link to the Past, Earthbound, Super Metroid, F-ZERO, Donkey Kong Country and Mega Man X all made the SNES an essential console to experience in the 90s. All of these titles and more are returning to the shelves with the SNES Classic, which releases later this year on September 29th with a price tag of $80. One of the most surprising additions to the SNES Classic library (the full list will be at the bottom of this page) is Star Fox 2, which never saw any sort of official release in any region. This sequel to Star Fox was originally set to release in 1995, but was cancelled because the Nintendo 64 was going to be released in 1996 and Nintendo wanted to focus more on developing games for the new console generation. Various elements of the game were leaked over the years after its cancellation, but nobody would have guessed that it was ever going to have an official release to solidify the existence of the game for the general public. Faithful to the original release of the SNES, the Classic systems are different between the US and the European/Japanese regions. The SNES Classic we will see in the US has the familiar rectangular shape with the sliding purple Power and Reset buttons. The Super Famicom Classic and the European SNES Classic share their original streamlined and curved design with controllers that have fun multicolored buttons. Some people in the US are displeased that we don’t get to experience the more streamlined design, but if you are that upset about it, you can always import the SNES Classic from a European country and it will have the same games as the US version. The Japanese Famicom Classic, however, will have Panel de Pon, Super Soccer, Legend of the Mystical Ninja, and Fire Emblem: Mystery of the Emblem instead of Super Castlevania IV, Super Punch Out! !, Kirby’s Dream Course, and Earthbound. Regardless of which design you prefer, the SNES Classic is going to be a wonderful blast from the past and give gamers a new chance to play these 90s classics. The SNES Classic comes with two controllers right from the box as well, so we can enjoy an authentic multiplayer experience with Super Street Fighter II, Kirby’s Dream Course, and Contra III right off the bat. September cannot come fast enough!